The popular free mobile game finally has a free flash version! Play 2048 online for free and work up to the elusive 2048! Combine the numbers on the grid to get a higher number on the grid and complete the nearly impossible puzzle. It's got great music, quick gameplay, and a beautiful puzzle system to keep you playing for hours. 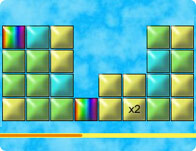 Use your arrow keys to move the tiles around to connect them.